Parking: There is plenty of parking at St Catherine’s but at Rozel the car parking is rather more limited. An early arrival would be required in the summer months and even then finding a place could be a challenge. There is also limited parking at Fliquet, suitable for a small group. Parking is free all year round at all these locations. Refreshments: At St Catherine’s there is quite a large cafe, which is open year round and serves a variety of food, drink and ice creams. 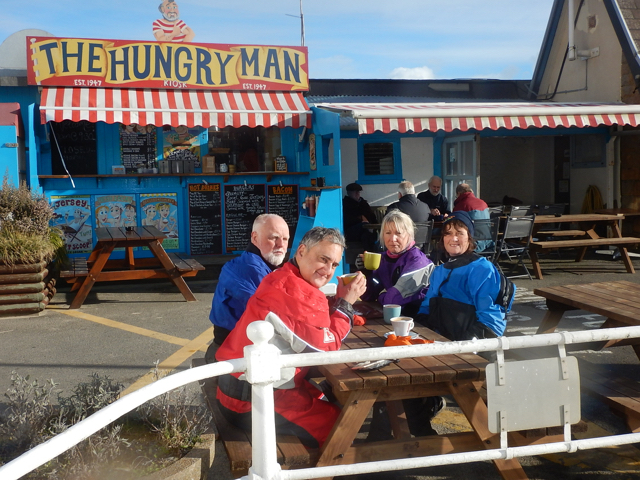 Whilst at Rozel there is The Hungry Man, a food and drink kiosk on the pier, which is virtually a Jersey institution. Slightly inland there is The Rozel Bay, pub which serves good pier and in the winter and a warm fire. Food is generally available at the appropriate times. St Catherine’s Breakwater. The slip is clearly visible, as is the small beach which is an alternative launching site to the north. Launching from St Catherine’s is generally pretty straight forward from the obvious slip. It can get pretty busy at times so take care to ensure that you are not hindering other water users. If there is wind from the south launching from the slip can vary between entertaining and impossible, particularly a couple of hours either side of high water. Assuming that you have been able to launch from the slip, route finding is fairly straight forward, follow the line of the breakwater. The breakwater was built in the middle of the 19th century, a harbour was planned for the Royal Navy, due to the perceived threat from the French. Work was abandoned in 1855, when it was decided that the water wasn’t deep enough. A lighthouse was placed on the end in 1857, which remained in operation until 1950, when it was replaced. The original lighthouse can be seen outside the Maritime Museum in St Helier, which is well worth a visit by visitors to and residents of Jersey. Conditions off the end of St Catherine’s Breakwater can vary between fairly benign to absolutely terrifying, so always approach with caution. You can normally see what conditions are like off the end if you stand close the Jersey Canoe Club premises. 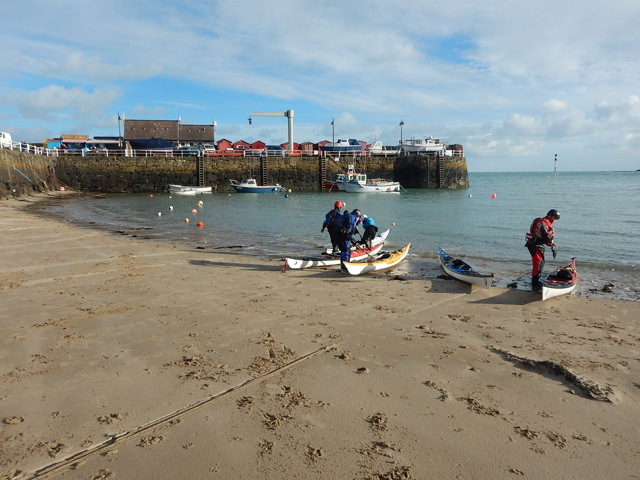 If there is any wind against tide conditions can be quite lumpy. Don’t be put off by potential conditions off the end, it is just one of those locations that requires an informed decision and respect. Once around the breakwater there are two options. Tuck in underneath the arm of the breakwater but if the tide is flowing north stay in the main run and start to turn west when Belle Hougue appears from behind Tour de Rozel. Using that transit to assist with route planning ensures that you receive maximum benefit from the tidal flow, as far as La Coupe. If you are not happy about the possible conditions off the end of the breakwater, then it is possible to launch on the northern side, avoiding the most exposed area. As you drive around the rock at St Catherine’s there is a footpath to your left. It rises quite steeply, whilst below it there is another footpath, which follows the coast for about 50 metres. It stops at a wall with a pebbly beach, scramble onto the beach, team work helps here, and then select one of the appropriate channels down which to launch. 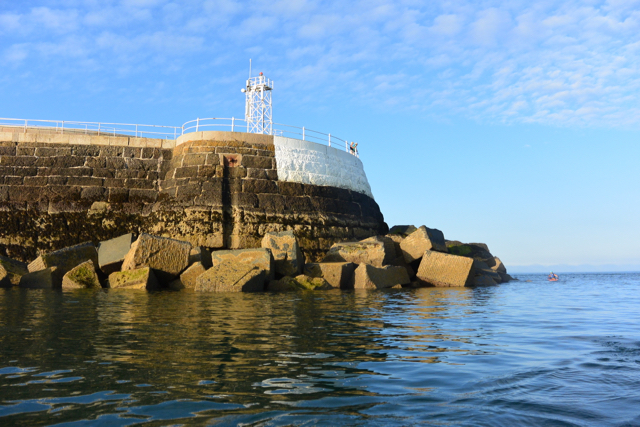 It is also possible to land here at the end of a trip if you don’t want to paddle all the way around the breakwater. Once afloat follow the coast to La Coupe. Built before 1787 to help protect this corner of the island from possible invasion by the French. Heading north you pass Fliquet Tower, which was built prior to 1787, to help defend the coast against possible invasion by the French. Just before the headland is the beach at La Coupe. Most days this is a really nice place to land for a picnic lunch and there is access to a road from here. La Coupe marks the north east corner of the Island, we are now turning onto the north coast. The main rock type in this area is Rozel Conglomerate, a rock which is fairly easily eroded, so it always mains its sharp edges. Hitting the rocks with the hull of your kayak along this section of coast can prove expensive, so if rock hopping is your thing it might be advisable to stick with plastic kayaks. Roughly midway between La Coupe and Rozel, it is possible to see one of the most important neolithic sites on the island, Le Dolmen de Couperon. A passage grave, approximately 5,000 years old. 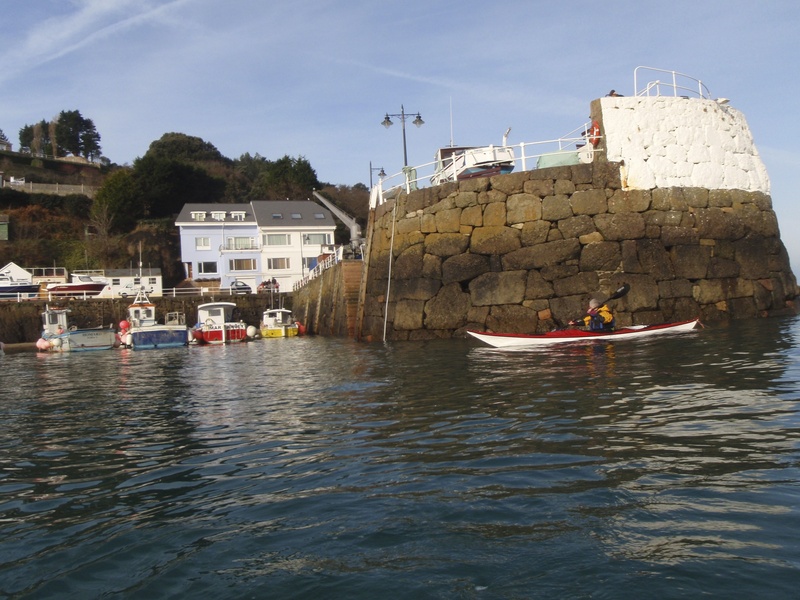 It is just so easy easy to go sea kayaking in Jersey against a rich historical background. 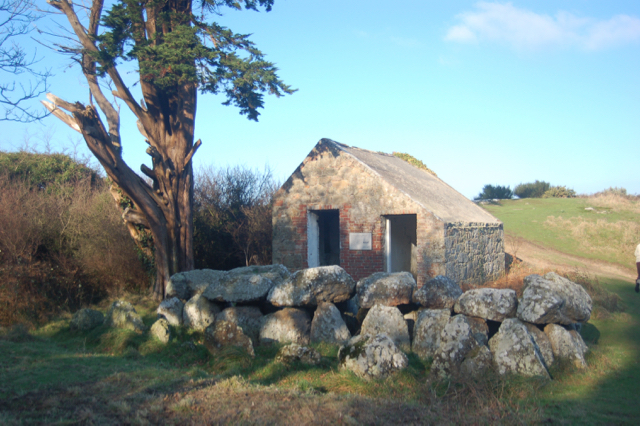 Close to the Dolmen is Le Couperon Guardhouse, which was built in 1689. 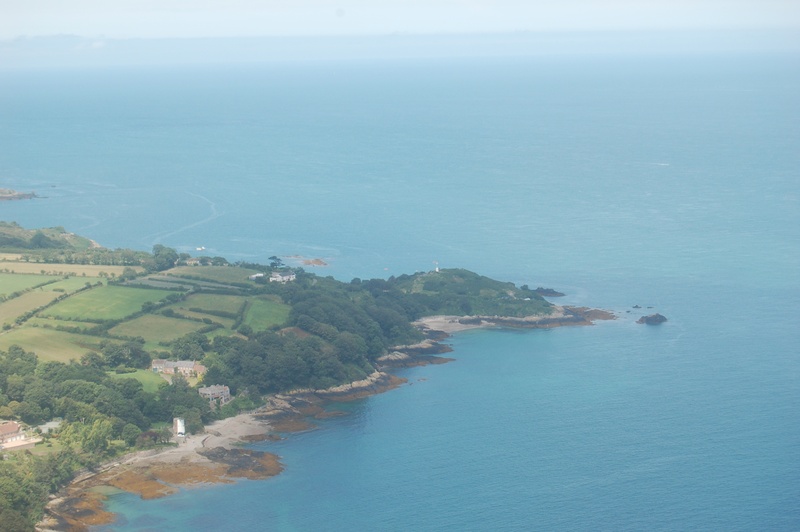 There are very places to land along here so it is best to aim for Rozel, easily identified by its pier. 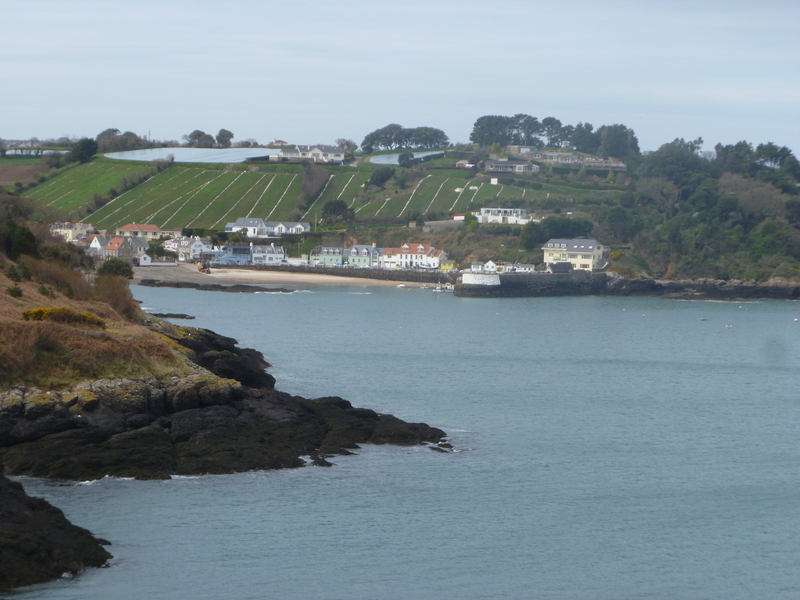 The small harbour was built in 1829, partly to meet the demand created by the oyster fishing industry in Gorey. 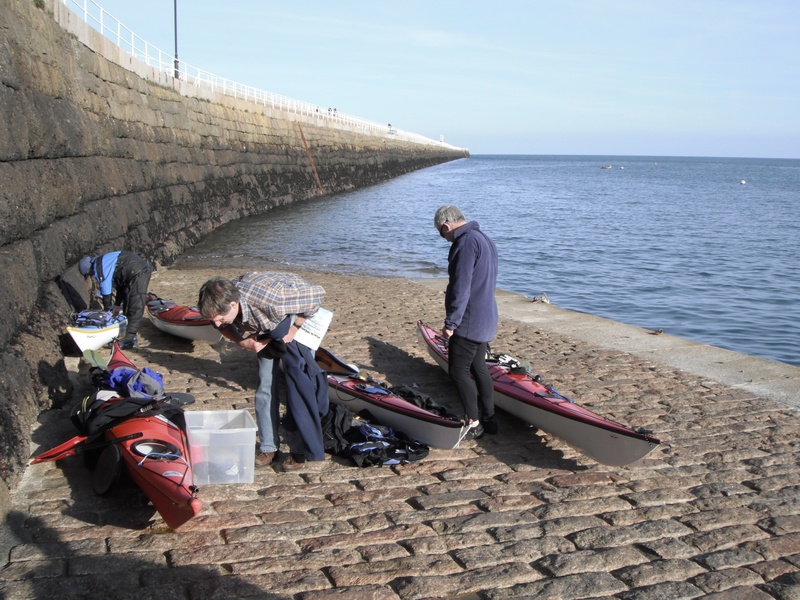 It marks the end of this section of coast so its either time to land for refreshments or to retrace our paddle strokes back to St Catherines. A thoroughly enjoyable section of coast to paddle on a warm summers evening. Off the end of St Catherine’s Breakwater the tides about 3 hours earlier. This means that at HW the tide is flowing north at almost maximum rate. A really useful tidal stream to take advantage of if you are planning a paddle along the north coast of the island. Preparing to leave St Catherine's on a beautiful March morning. We wwere actually heading to the Ecrehous for a couple of days. The coast from Fliquet past La Coupe. The sandy beach, which is perfect for picnics is directly below the white navigation mark. The dolmen and the guardhouse can be picked out from the sea, particularly when heading from east to west. Rozel viewed from the east. Entering the harbour at Rozel on a sunny winters day. Coffee and cake in December sunshine. Another sunny winters day at Rozel.